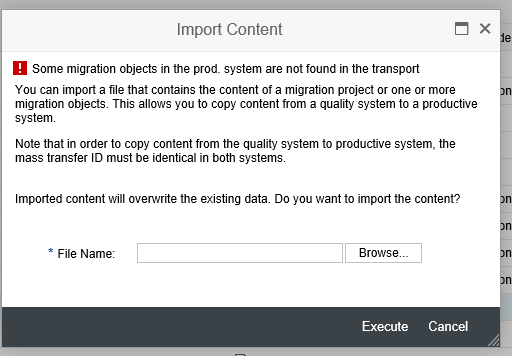 in case you created your project in your DEV sytem and now need to transport it to QAS system, you can use the Import/Export functionality to transfer your project from one system to the other. A zip file is beeing created. In QAS you create a new migration project with the same Mass Transfer ID – this is prerequisite !! Next use the Button IMPORT CONTENT in this new project. 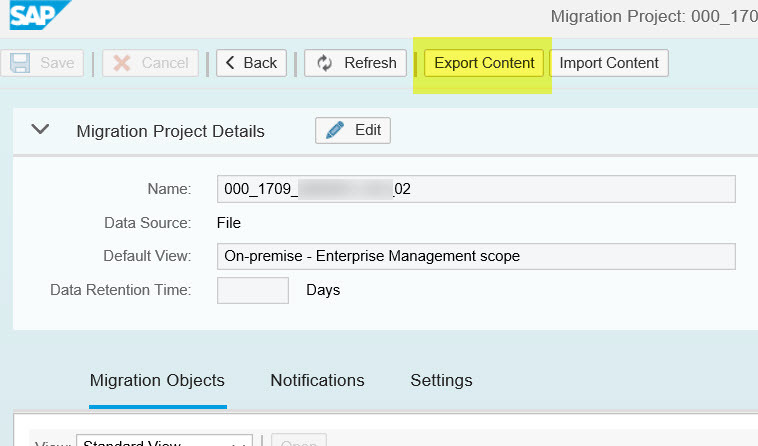 You find more information also in the Help-Portal help.sap.com – Migration Cockpit. Does the export work for different landscapes, e.g Sandbox to Dev, Dev to QA etc? I am trying to do some import and I am getting an error. The message you get tells you that there are some migration objects already acitve for the project you want to import. This was done manually – someone did activate a migration object in the “new” project in DEV system. Create a project in e.g. Sandbox system. Do the tests in this project. Export. Create new project in DEV – note: Mass Transfer ID must be identical! Do not manually activate migration objects here! If you do have to work in a next cycle to improve your results, use the project in Sandbox, change it, export and import in DEV again. Then you will be asked for overwriting the exsting one. Your reply is correct, I am going to follow the process you recommended when we are moving from Dev to Q. When I’m importing the object. I’m getting 500 Internal server error. Please note we have follow note but the issue not resolved. I’m encounter the same issue. Are you managed to resolve it now? I did the below steps to resolve the internal error issue. 3. Select the row which has ‘SLO’ in it. We have implemented the SAP Note 2628948 and 2617067 but we are getting errors after importing the Migration Project from Dev to QAS system. Could any one let me know if any one has faced this kind of issue. Please provide your help. Re-generate the Migration Object in LTMOM Transaction. I am trying to create a new project ftom ltmc in Quality system in order to import the project that i have created in development. I receive an error message that this mass tranfer id already exists ! I can see the project (that i have created in dev and uploaded the master data successfully in dev) in ltmc when i open it from quality system but the migration does not upload the file in QA. Do I have to make the project inactive first and then create again with the same mass tranfer id and import the zip file ? no – you do not have to deactivate the project. Which release are you working on? Did you check OSS notes on this issue? Now MC allows working with STAGING tables. Is the import/export of a project the same? Re-enter the project -> staging tables have to be synchronized as the old staging table names are there. Start Synchronization -> that means new staging tables will be created with SYS-Id. The created staging table get the next free number. There is no linking between objects and numbers. We are aware that this is an issue when you have own programs for filling the staging tables – especially for go live. We work on this and in future release we will provide kind of mapping tables.